Using a 3w RGB LED, Arduino UNO, an accelerometer and a Nike Air Max shoe, I was able to get a proof of concept up and running. It is not an elegant solution but it definitely has the potential to be shrunk down and integrated into the shoe in the future. 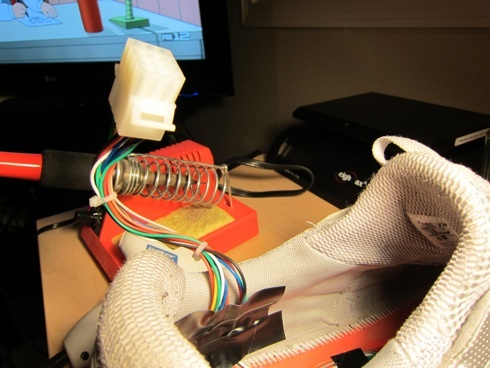 I began by drilling a hole near the back of the shoe where I could mount the RGB LED in. 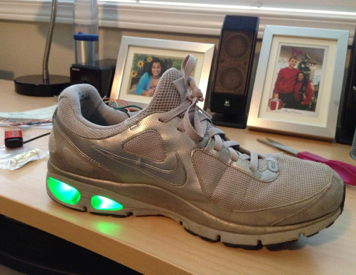 By placing it here, the light will diffuse throughout the clear bubble of the shoe. I ran the four wires from the led out the side where I would connect them to a molex connector later. 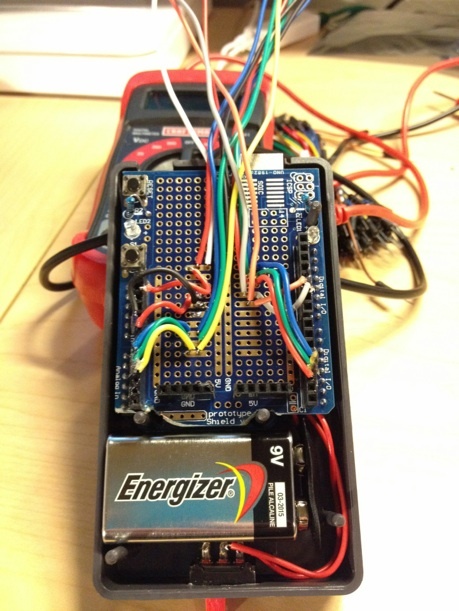 Here is my analog 3-axis accelerometer all wired up and read to be implanted into the shoe. 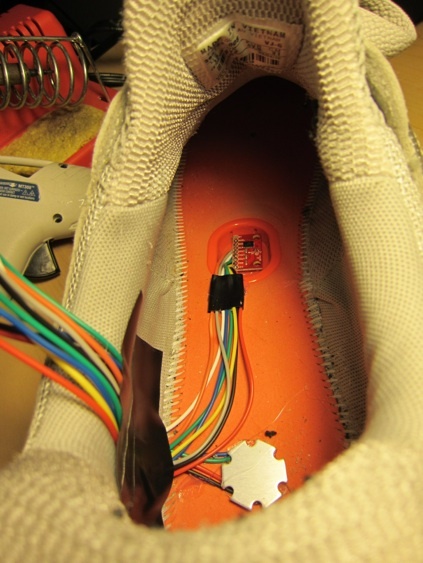 The Nike+ adapter slot in the bottom of the shoe conveniently fits the accelerometer right in its place. 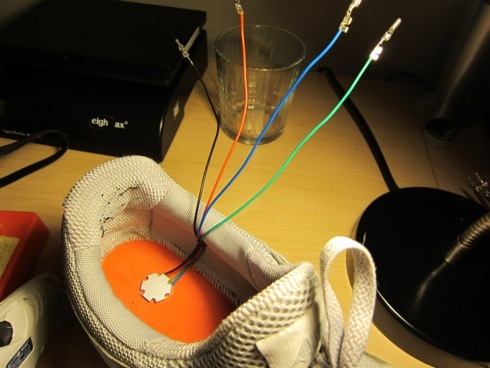 Hot glue holds everything in place and the wires are run up the side of the shoe. The 12 pin molex connector is attached which will allow me to easily remove the controller box during transport. 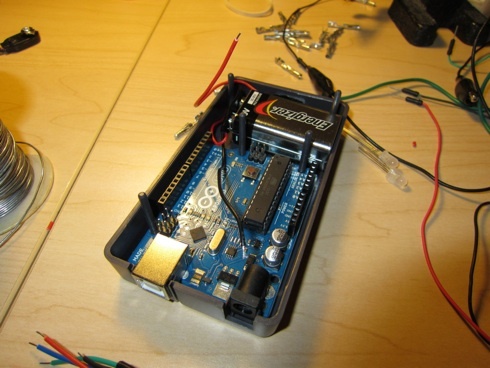 I was able to locate a project box designed for Arduino which allows everything to fit snugly. The whole thing is powered by a 9v battery which later turns out to cause come issues with the amount of power the LED draws. Future revisions will need a beefier battery and power management system. I didn't want to attach any of the wires directly to the Arduino so I soldered them to a prototype shield which plugs into the pins on the Arduino itself. Here is the completed controller box which plugs into the shoe. I am well aware of how impractical this setup is but its only a proof of concept! To make it less awkward, I strapped the box to my leg and ran the wires up to hide it while wearing it. Surprisingly I was able to run a few miles with it without it falling apart and its still holding up even after running in the rain with it. 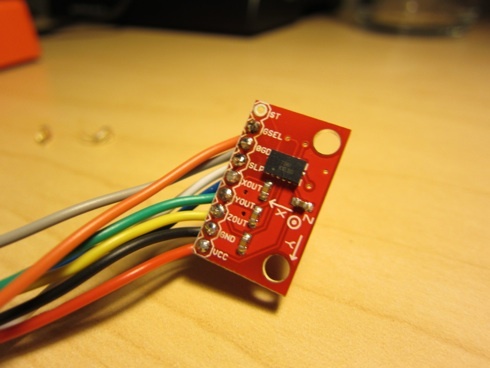 The hardware was probably the easier part of this project other than the amount of time it took to put together, but the software to power it was a little more difficult. Since an accelerometer only tells you what angle the shoe is at, I needed to convert that into something that would tell me if the shoe had been moving within the last few seconds and if it was still moving. I essentially created a function that detects of the angle changes a certain amount of times in a certain amount of time and tells the LED to change to either red or green. Simple enough but it took a little debugging to get it to work. I don’t plan on stopping here. I am already working on the next edition which I aim to make fit in the Nike+ slot in the shoe instead of having a controller box. 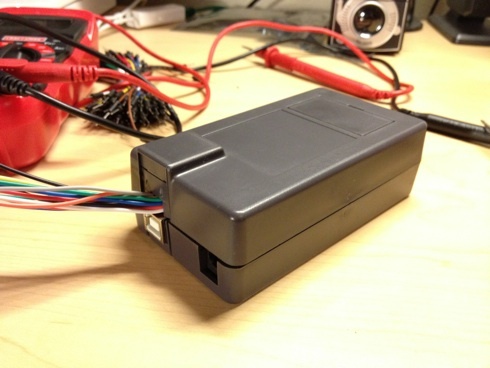 Mounting a battery somewhere is going to be the tricky part but that will be something to figure out later.